Readers of this blog know that I like to write about hybridity, which I define as the mix of online and offline action in the context of digital activism. Â In reality, there are at least three kinds of hybridity that describe the intersection of digital and analog culture: spatial hybridity, organizational hybridity, and systemic hybridity. The type of hybridity I refer to most often on this blog is spatial hybridity, the switches from digital space to physical space and back again. Â For example, the Million Hoodie March last year was spatially hybrid because Facebook was used to mobilize an offline march. This type of hybridity is extremely common in digital activism and may, in fact, be universal, since the people who engage in digital activism always exist in physical space, even when they are typing away at their computers. Â Also, institutions of power, such as governments, still exist in physical space, so digital action must jump the bits-to-atoms barrier if they are to have impact. The second kind of hybridity is organizational hybridity, and has to with the behavior of organizations.Â Â The analysis of organizational hybridity is most associated with Andrew ChadwickÂ of the University of London, andÂ relates to the convergence of repertoires of contention (tactics) within single organizations. A network and a newpaper collaborated… to identify two innocent men. All three types of hybridity have been on display in the investigation into the Boston bombing. Â In an excellent pieceÂ with implications for systemic hybridity, Charlie Beckett of the London School of Economics writes that networked individuals and formal news organizations have been interacting and collaborating, though sometimes not for the best. 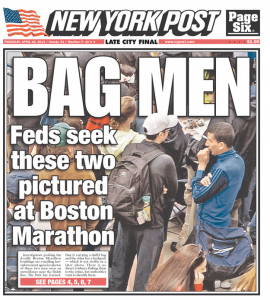 Â In a stunninglyÂ irresponsibleÂ move, The New York Post ran a frontpage photo of two young men it claimed were bombing suspects (see image left). Â The men turned out to be totally innocent. The photo came from the social news and entertainment site Reddit, some members of which were collaborating to identify the bombers, an example of organizational hybridity. Â Though usually a site for sharing and rating news stories, the members of Reddit used the site infrastructure to create an investigative group (called as “subreddit”) on the site. Â The transfer of the photo from a digital forum to the page of a physical newspaper is an instance of spatial hybridity. …this all shows that we need more good journalism not less. The folks contributing on Reddit arenâ€™t trying to replace CNN. But both need to pay attention to each other and improve what they do. We have the right to communicate but we also have responsibilities to do it well.